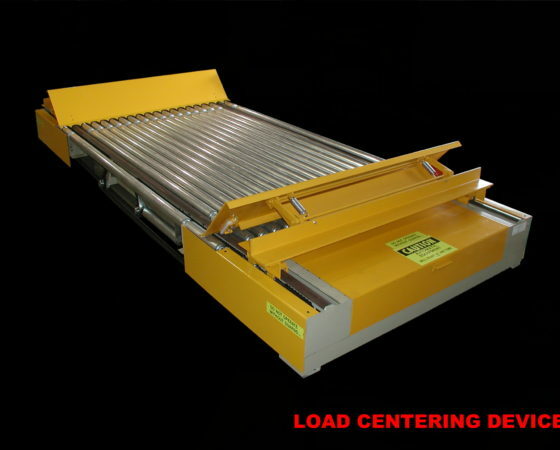 LDC | Mainline Conveyor Systems, Inc.
Mainline Conveyor System’s Centering/Squaring Device consists of a roller conveyor section with a pair of opposably mounted pusher heads on either side. The heads are pulled along a pair of guide rails toward each other at equal speeds by means of power transmission chains driven by a gearmotor. The motion of the heads when driven toward each other will push a unit load into the opposing head centering it on the conveyor. A controlling mechanism may be adjusted to determine the amount of force with which heads “squeeze” the load once it has arrived at the center of the conveyor. Heads provided may be fold-up or straight. Straight heads are fixed pusher bars. Fold-up heads include a scalloped plate that is spring loaded at a sloped position. The points of the scalloped plates extend below the surface of the rollers. As the head engages the load the plate moves to a vertical position and begins pushing the load toward the conveyor center.